I have to say, I am pretty impressed with the people I have met online in the last six months. One of them even gave me the "Shine On" award! Of course, I have developed a good relationship with her during this time, and even had her guest post for me on my other blog, Lorraine Reguly's Life, which is a WordPress blog where I share (probably way too much) information about me, my life, and my experiences, and which also showcases many author interviews and guest posts. In honor of receiving this award, I have written a poem, which I hope you will enjoy. the art of a poem. 3. I prefer poetry that rhymes. 4. I am a university graduate. 5. I am a single mom, and have been for about 23 years. 6. Both my parents are still alive. 7. All of my grandparents have passed on. 1. I don't like following a bunch of rules all of the time, so I am adding this list of seven more things about me. 2. I like chocolate, lobster, pizza, and steak. 3. I enjoy crime dramas on TV. 4. I taught high school math and English for over 3 years. 5. I think many teenagers are misunderstood. http://cheryllynnroberts.wordpress.com/ "Cher Shares" is the title of this blog. Ms. Vee's Blogs..Anything Goes." is the title of this blog. http://kurtrees.wordpress.com/ Kurt writes some really good poetry on his blog. I really like it; it has its own unique flavour! I found these blogs via a poetry community on Google+, and wanted to give them a mention, since this is a poetry blog, after all! http://lovepainandothercatastrophes.blogspot.com.au/ Poetry is shared on Google+ by this poet, Yobial Marin, all the time! http://alparryblog.wordpress.com/poetry/ Al Parry's blog, which includes poetry! Much thanks to Aleshia Clarke for this award! I love comments, too, so please don't be shy about leaving one! Thank you! Thank you for nominating me for this award. Your comment went to my spam folder; so it a bit for me to find it. I am always honored to be recognized by my readers and fellow bloggers for my work. But I am very very behind on accepting award nominations and doing the posts. I kinda figured it might end up in some spam folders since it contains a link. A mere mention of my name/blog would be nice, even if you choose not to accept this award. I think this gesture would make you "shine" in the the eyes of your other readers, too. I am so happy you decided to accept it! I have not heard of the blogs you nominated, so this just goes to show that these awards are useful! I plan on visiting a few of them! I actually did not know you accepted, so I appreciate that you told me. Sometimes, it takes people a few weeks to "accept". Also, Google did not notify me of a backlink to this blog. I don't know a lot about this platform; I know more about Wordpress since that is where I began my first (and main) blog. It's called "Lorraine Reguly's Life", found at http://lorrainemariereguly.wordpress.com if you want to take a look. Sometimes good things are the things that take us completely by surprise! Congrats on your award, Lorraine! You really seem to be enjoying blogging. I love it, too. But do find it time-consuming, as I now have 3 blogs to maintain, and with book promotion on the horizon, it's more than I can handle. Thank you very much for nominating me for the award as well. As I am due to do a post on my writing blog this week, and have many writer friends who have great blogs, I will graciously accept the award and post my entry later today. Cheers, and have a super day. Thanks, Doreen. It's good to see you again! I know how busy life can get, and I appreciate you taking the time to accept this award. Congratulations on your award! I haven't had the chance to read your blog poems. But the one above is very nice. 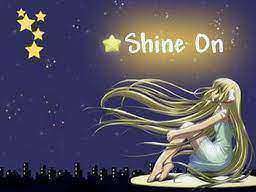 Thank you very much for nominating me for the Shine On Award. I am grateful to except it, however I don't have any nominees. I follow a few bloggers. The ones that haven't published any writings, do not accept awards. Please let me know your thoughts on this. Thank you again! Have a wonderful day. If you would like to find some new blogs to read, you can find them almost anywhere; it depends on your interest. Do a search using a search engine, or use Networked Blogs to help you find blogs you might like. As for accepting the award, maybe just write a blog post explaining this dilemma, and let your other readers know that you have been nominated by me! Feel free to continue this conversation! Yes it does help. I noticed that you have met the infamous OM..If you follow him, you will see why I don't follow many blogger. Don't have time, he is an awesome writer. I will take your advice. Do you think it is acceptable to display the logo? Thank you again! I think that, ultimately, what you do is up to you. Personally, I would display the logo/image/pic in the blog post, not in a widget. I also think that it would be acceptable to nominate as many blogs as you follow, if the number is less than 15. Two or three is fine; just state that you don't follow that many! In time, you will see that many bloggers have received different awards, but they all have pretty much the same rules. The idea is just to recognize other bloggers, newbies especially, and to meet other people. If they are talented, too, that makes it all the better! Another fabulous poem Lorraine! I am glad we had the chance to work together - plus, your English tips have helped get me up-to-speed! The feeling is mutual, Aleshia! I didn't become a teacher for nothing, you know! Thanks, too, for the compliment on the poem. I think it took me about 10 minutes to write/type. I love the poem. That is such a cool way the do this. I have a few awards outstanding and you have given me an idea. I can't wait to see/hear your idea...what is it...or do I have to wait for it? Congratulations Lorraine. What a wonderful way of accepting the award. Thank you, Debra. I was pretty pleased to get this award!